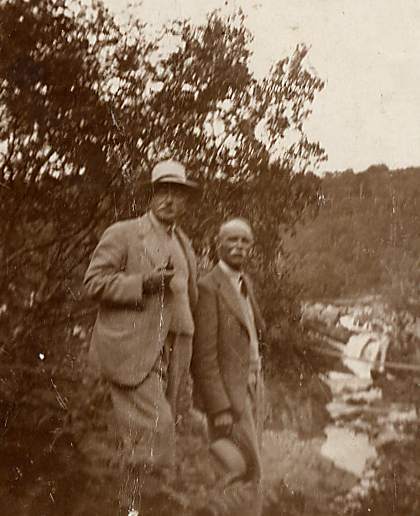 Walter Neil Denoon is the gentleman on the right of the picture .... probably taken during one of his many holiday visits to Cromarty. Walter was the brother of my grandfather ( their father being Walter Ross Denoon, born in 1832 at Cromarty ) . At some time Walter Neil was a member of the Robertson Lodge Cromarty Freemasons...... Thanks to Helen and Bobby for getting the original title of the picture corrected. Just come across this photo whilst browsing through the library. Would anyone know if this is the same William J Smith who lived in Duke St and who was President of the Scottish Clans Association of London during the 1920s? I have his photo in full Highland Dress taken at a complimentary dinner in his honour in 1928 but not sure if it"s the same person or not.